In 1915, Einstein predicted gravitational waves—the last unproven part of his theory of general relativity. This week—just over one hundred years later—scientists say they’ve detected direct evidence of these ripples in space-time. Physicists Kip Thorne and Gabriela Gonzalez, of the LIGO Observatory in Livingston, Louisiana, discuss how the gravitational waves were detected and what the impact this finding could have on future cosmological observations and discoveries. Kip Thorne is a theoretical physicist; executive producer and science advisor on Interstellar (Paramount, 2014); and author of The Science of Interstellar (Norton, 2014), based in Pasadena, California. Gabriela González is the Spokesperson of the LIGO Scientific Collaboration and a Professor of Physics and Astronomy at Louisiana State University in Baton Rouge, Louisiana. IRA FLATOW: This is Science Friday, I’m Ira Flatow. It was called the Beep, heard around the world years ago that Sputnik and the signal that we just heard is actually a chirp. Let’s listen to that again. Get it together. That was the Sputnik. It was really an iconic sound, the first artificial satellite launched by the Soviets almost 60 years ago. And that was called the Beep heard around the world, and it signaled the arrival of a new era of space exploration. Yesterday, researchers revealed what might be called the Chirp heard around the universe, or maybe more colloquially, the Tweet, right? The universe tweeted us. 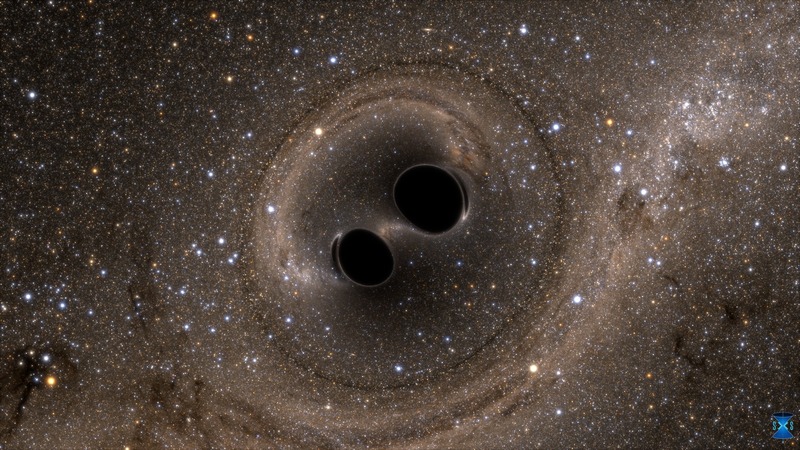 Scientists from the LIGO collaboration captured the first sound of gravitational waves. And that showed that Einstein’s century-old prediction of gravitational waves, a part of his theory of general relativity, was finally proven when this signal was discovered last fall. Why has this discovery so excited astronomers and physicists? My next guests are here to talk about that. Kip Thorne is the Richard Feynman professor of Emeritus of theoretical physics at Caltech. He’s co-founder of the LIGO project. Welcome back to Science Friday. KIP THORNE: Great to be back with you, Ira. IRA FLATOW: You’re welcome. Gabriela Gonzalez is one of the scientists on the LIGO scientific collaboration. She’s also professor of physics and astronomy at Louisiana State University in Baton Rouge. Welcome, Dr. Gonzalez. GABRIELA GONZALEZ: Hello, Ira. It’s an honor to be here. IRA FLATOW: Well, thank you. KIP THORNE: And so Ira, let me just say that Gabriela Gonzalez is the spokesperson for the collaboration. She’s the head honcho. IRA FLATOW: You know, I know she’s the head honcho, and no one is calling her that. She deserves to be called that, doesn’t she? IRA FLATOW: I knew that. But that’s all I keep saying is we’ll only talk to you, Gabby first. Let’s talk about the moment of discovery. Now from what I can read or what I hear is it was a grad student, post-doc Marco Drago sitting at his desk in Hamburg, Germany, during a shakedown run, a test run of the LIGO before it was really online. And he heard the sound, or he saw the tweet coming in? GABRIELA GONZALEZ: He saw it on a web page. It wasn’t quite a tweet. It wasn’t a sound yet. It was a web page that indicated there was a candidate in coincidence between the two LIGO detectors that look to be very, very significant. And he sent emails that generated hundreds of other emails that day. IRA FLATOW: And what are the odds? Before you started this experiment, we heard all kinds of astronomically high numbers for the odds of actually detecting gravity waves, Gabby. GABRIELA GONZALEZ: They always worried that we were going to do astronomy, and those were very high. I did know that the odds were astronomically high. But we were preparing to take observing runs starting in 2015 with the first. We are going to do another one this year, another one next year. And we were all counting on the second and the third observing runs to be the ones that really detected gravitational waves for the first time. But nature decided to surprise us and do it a lot earlier. Which was very nice. IRA FLATOW: Kip, so it was really a surprise. Was it kind of lucky to get it? KIP THORNE: Yeah. It was lucky in retrospect. It’s not a complete surprise. This signal is almost, but not quite strong enough to have been seen in the previous detectors, which the experimental team had built and run in LIGO. And so and we didn’t know that, of course. But the improvement from there until now is a factor of three, meaning you’re seeing out the three cube 27 times farther volume into the universe. And the fact that this just below where we could detect before, would show up early and loud and clear. Well, it’s just because we weren’t quite good enough before, and we now are much better than good enough. IRA FLATOW: How did you know what to look for, what the signal would look like? GABRIELA GONZALEZ: Well, we looked for in many different kinds of signals with waveforms based on the Theory of Relativity. The one that matched this observation was from a black hole, and that’s how we know what the source was. IRA FLATOW: Could it be that we have detected gravitational waves in the past, and that it’s buried in data somewhere? Looked over as noise? KIP THORNE: No, I don’t think so. The data analysis team that Gabriela Gonzalez and her colleagues have put together is superb. They have the best techniques. Techniques that are the equal of the very best in any other field of science and technology. And they looked long and hard at all the earlier data. There is nothing in the earlier data that is allowed enough that it could be a serious candidate. IRA FLATOW: Now Einstein 100 years ago, pictured gravity as ripples in the fabric of space time. But modern science now talks about quantum particles of gravity. Gravitons. Would gravitons also be ejected in theory during this binary black spinal spinning emerger? KIP THORNE: Well, these gravitational waves in some sense, are carried by gravitons. Gravitons are the complementary description of any wave phenomenon. When you have huge numbers of gravitons, you can’t see the individual ones, the huge numbers of gravitons behave like waves. And in these gravitational waves, there are ultra, ultra, ultra huge numbers of gravitons. So they look very much like a wave and you don’t see the particle aspects. IRA FLATOW: Do we have something that would detect the particle aspects of them? KIP THORNE: No, and we won’t have for a very long time. However, maybe you can talk about this, Gabby. From these observations, LIGO has been able to say something about the mass of the graviton, remarkably. The wave aspect also carries information about the underlying particles. And LIGO has made very significant inference about these particles, or gravitons. Gabby? GABRIELA GONZALEZ: That’s right. If you assume the theory of relativity, you can devise a lot of information from the data. But you can also use the observation to test the Theory of Relativity. The theory says that the gravitons should have no mass, and that is the same thing as saying that its wavelength is infinite. And we now know from this measurement that that wavelength is more than 10 to the 13 kilometers. That’s a very, very, very long distance. IRA FLATOW: We’re not surfing on that thing. Let’s talk about the beginnings of this project. You were there at the very beginning. How long ago does that go back? KIP THORNE: Well, the earliest work by Ray Weiss and me and Ronald Reeve are all completely independent on the foundation for it. We were all working on independently different aspects of it already in the late 1960s. And so it goes back half a century, basically. And the foundations for that that we were building on, and the inspiration was the work of Joseph Weber that go all the way back to 1960. So that’s what, about 55 years ago. IRA FLATOW: It hasn’t been smooth sailing along the way, has it? KIP THORNE: No, it’s not been smooth sailing. The remarkable thing is it through the rocky parts of this, our partnership with the National Science Foundation has been rock solid. The National Science Foundation is our partner in funding and in providing us the support in dealing with the outside world, with Congress. And the National Science Foundation, the program directors who began work with us. And the head of physics division, Marcel Bardon and Richard Isaacson. They gave us tremendous support at the beginning. The National Science Board oversees the NSF right through all the rocky parts and the smooth sailing parts, right up to today. IRA FLATOW: Gabby, there was a lot of testing. In fact, the LIGO system was going under test systems as it was detecting these first signals. And false positives are injected into the system to keep the scientists on their feet. And in fact, I think Marco said, he thought it might have been a false positive as a test signal. So how do you approach the data when you first received it, especially this one? Were you skeptical that this was a real signal? GABRIELA GONZALEZ: Well, I have to admit that the injection system to put these false positives in the data, is one of the things we had been testing those days. So we knew that we weren’t playing this game, if you want, of blind injections. But we were testing those systems. So the first thing I thought was that somebody had made a mistake, and the test was done without informing people. But we knew very, very quickly that that was not true. We not only asked those people, but we looked in the data. We have lots of channels where we monitor injections, and there was nothing there. But that was the first thing everybody thought. That this had been a false positive. KIP THORNE: Some of the experimenters who do this have described to me as, if anybody tries to do a blind injection leaves fingerprints all over the place. And there were no fingerprints anywhere. IRA FLATOW: So what you’ve basically created is a gravity telescope, right? I mean, it doesn’t detect light. It detects gravity waves. GABRIELA GONZALEZ: That’s right. That’s exactly it. And like telescopes, you can have different kinds of telescopes. X-ray telescopes, radio telescopes. This is the telescope that looks for gravitational waves of very short wavelengths. But there are several other gravity telescopes out there that are going to see other signals, we hope soon, too. IRA FLATOW: Could you pick up gravity waves from the Big Bang still around? KIP THORNE: Our community of astrophysicists, physicists, astronomers expect to. Initially, those will be seen almost certainly in the next few years through something called the polarization of the cosmic microwave background. This is the idea which is in the Big Bang, gravitational waves were produced along with matter. They traveled outward through the universe in a particular period when the universe was 280,000 years old. And when the electrons and protons were combining together to form neutral hydrogen, that was the last moment when electromagnetic waves would scatter off electrons. And if the electrons are being stretched apart and pushed together by gravitational waves, at that moment, the gravitational waves would put an imprint on the electromagnetic waves. And these electromagnetic waves are detected and studied in great detail by observational cosmologists, using the COBE satellite, the Planck satellite and others on the ground. The BICEP instrument at the South Pole, for example. And that signal, that imprint, has been seen but it can also be produced to some degree by emission of electromagnetic waves from dust. And so that community is working very hard to separate out the real signal, which is the imprint of gravitational waves from the Big Bang. Separate that signal out from the spurious noise that’s coming off of dust. And that will be sorted out I’m sure, within the next few years. And that will be an enormous triumph. Looking at gravitational waves with a very different wavelength, a very different period of oscillation. The one LIGO sees have periods of milliseconds. These have periods of hundreds of millions to billions of years. And enormously different gravitational waves, enormously different information about the universe. IRA FLATOW: We’re talking with Kip Thorne and Gabriela Gonzalez on Science Friday from PRI, Public Radio International. And Gabby, now that we have this gravitational telescope, what can we learn about the universe from studying the gravity wave? GABRIELA GONZALEZ: Well, we are already learning a lot. We suspected, but didn’t know that black holes of these masses existed before. We knew about very large black holes in the centers of galaxies, we knew about small black holes from electromagnetic information from stars around them, that black holes as large as the ones we saw that had 30 solar masses each and formed another with more than 67 solar masses, we have never seen that. This leads us to understand much more about black holes. Where they are, how big they are, how fast they spin, how often they meet in couples that dance and sing together, like the ones we saw? And black holes, and how stars evolve, and how they form, and how they merge in galaxies. That’s the history of our universe. IRA FLATOW: Do you think we could learn anything about the dark matter and the dark energy from listening to the black holes and the gravity waves? KIP THORNE: Well, I wish that the dark matter was made of black holes, but we’re pretty sure it’s not. We’re pretty sure that the fundamental particles that just don’t couple very strongly to the kinds of particles that we see. So I don’t think we will learn much there. On the other hand, these gravitational waves are very interesting, in the sense that that binary is like the black hole binaries or neutron star binaries that spiral together. They give you an ability to measure the distance to the source with enormous accuracy, ultimately. That is a direct observable, as we say. The electromagnetic observations are thins to help us to measure the red shift of the source. How fast the source is moving away from us with enormous accuracy. And so ultimately, if we can combine the electromagnetic observations with the gravitational observations, we then see both the distance to the source and how fast the source is moving away at great distances from the earth. And from that, we can infer the history of the expansion of the universe with very good accuracy. And that’s the hope. From that, we will be able perhaps to learn a lot about the dark energy. But it requires combining the observations of the electromagnetic telescopes with the gravitational wave telescopes. IRA FLATOW: Gabby, in the last minute we have, how would you characterize the import of this discovery? GABRIELA GONZALEZ: It’s amazing, but it’s just the beginning. It’s really opening the window that now you have the whole landscape out there to look at. There will be many more detections to come of this, and other surprises. We were surprised about this one. Who knows what other surprises nature will leave us? IRA FLATOW: OK I’m going to leave it right there, because it can’t get any better than that. Gabriela Gonzalez, spokesperson for the LIGO Scientific Collaboration, Professor of Physics and Astronomy at Louisiana State University in Baton Rouge. Kip Thorne, Feynman Professor of Theoretical Physics, Emeritus, California Caltech in Pasadena, California. Congratulations to both of you and to the whole team. KIP THORNE: Thank you, Ira. IRA FLATOW: We’ll be watching and listening for more news over the years as it happens. Thanks for taking time to be with us today. We’re going to take a short break. And you can watch a video Dr. Gonzalez talking about the discovery. It’s up there on our website at Sciencefriday.com/ligo, specially made for us. It’s a great discussion by Gabby. When you find yourself wanting to re-read a book that you just finished, you gotta recommend it to others.